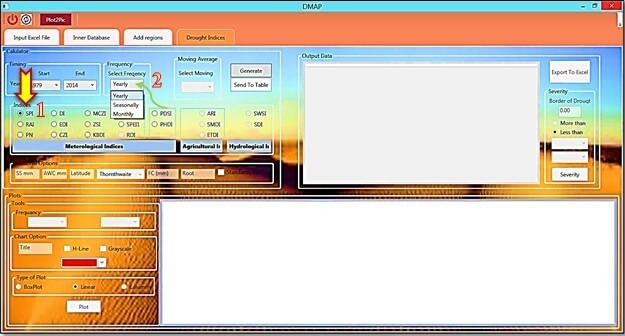 How can we run DMAP V1.0 (Drought Monitor And Prediction)? 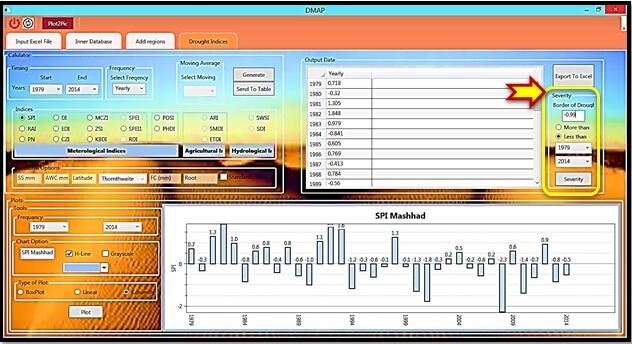 The DMAP (Drought Monitor And Prediction) software is a comprehensive tool that can calculate 18 drought indices in three different drought types, namely meteorological drought (SPI, PN, DI, RAI, RDI, ZSI, CZI, MCZI, EDI, KBDI, PDSI, PHDI, SPEI), agricultural drought (ETDI, SMDI, ARI), and hydrological drought (SWSI and SDI). For running this software you can follow these steps one by one. The DMAP tool has 4 tabs, that in this version the point option is active, the region ability will active in the next version (Fig. 1). For starting the software, firstly select the first tab, “Input Excel File” (Fig.2 No. 1). If you want to browse a text file, first you should assign your delimiter (such a space, comma, semicolon, etc.) (Fig.2 No. 2), if you want to browse an excel file it doesn’t need to assign a delimiter. Then you can press “Open File” (Fig.2 No. 3). In Fig.2 No. 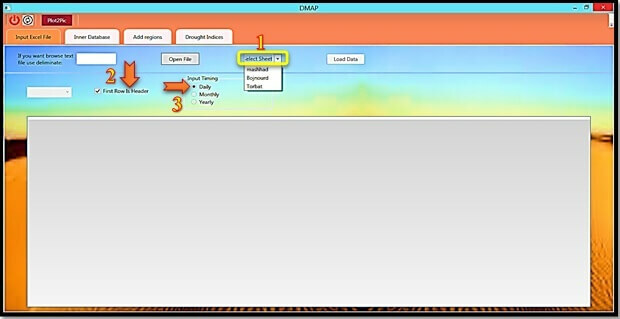 4, you can see the open window for selecting the desirable input file. In the open window, you select your file easily, and then click “Open” button. According to the Fig. 3 No. 1, you can see all the sheets that are available in your excel file, so select the proper sheet. 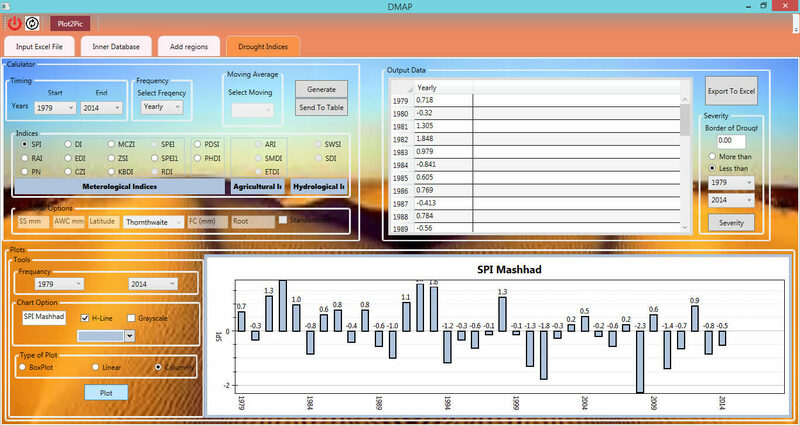 In this example we select “Mashhad” sheet that it has several important weather data of Mashhad synoptic station. If your excel file sheet has header of columns so please select the “first Row is header” option (Fig. 3 No. 2), also in “Input Timing” you can select time scale of the input file. In the presented example here, the input data are in daily sale, so we check “Daily” (Fig. 3 No. 3). After the desirable sheet was selected then it is the turn of assignments of weather variables. Therefore, as presented in Fig. 4 No.1, you can apply the format of your time scale. If your time data have a format like the 1986, then you should select “YYYY” in the combo box (Fig. 4). In this example for time, there are just the Julian years for each day of year. Fig 4. Select the format of time. Then you should assign the header of each column. Attention please, as you see in Fig. 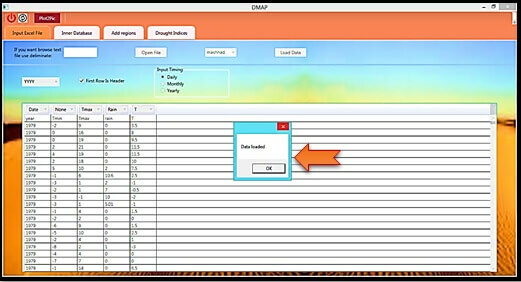 5, in this example the first column was assigned to the “Date”, but there is not any special order for the columns, and this is actually one of the best advantage of the DMAP tool. Also, as presented in Fig.6 assign all the variables, if one or more columns are not necessary to assign, you should remain them with any header. As you see in Fig. 6, in this sample input file the second column not necessary for assignment, so the header is “None“(Fig. 6 No. 1) and it doesn’t consider for calculation drought indices. In this sample the first column is “Date”, and others are respectively equal to “None”, “Tmax”, “Rain”, and “T”, that Tmax refers to maximum temperature, Rain for the amount of precipitation, and T refers to mean of temperature. Finally, press the “Load Data” button (Fig. 6 No. 2). Then you will face to a small window “Data loaded”, click it and go to the next step (Fig. 7). In this step please click on the “Drought Indices” tab in the Tab menu. The first panel in this screen is related to the “Calculator” setting. According to the Fig. 8, you can see a small panel that its name is “Timing”. In this panel you can set the start (Fig. 8) and the end (Fig. 9) years. Then you can select your desirable index from the “Indices” panel, then the “Frequency” panel will highlighted for selecting. According to the selected index in “Indices” panel, the “Frequency” panel has different type. In this example, since the “SPI” index (Fig. 10 No. 1) was selected so the “Frequency” panel has three types, namely Yearly, Seasonally, and Monthly. As you see in Fig. 10, we selected “Yearly” type for calculation of SPI output (Fig. 10 No. 2). By clicking “OK” button, the index’s value was calculated if the user wants to see the values, by clicking the “Send to table” button (Fig. 12 No. 1), the user can see the values of selected drought index in the “Output Data” table (Fig. 12 No. 2). 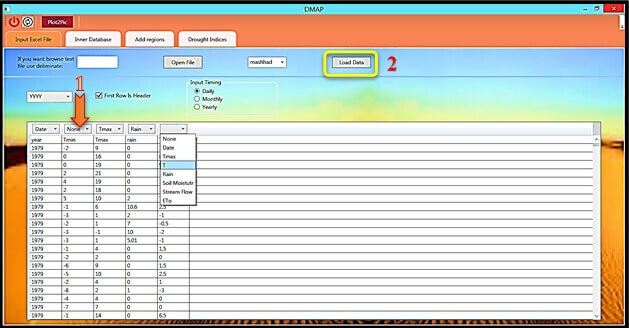 If the user wants to export the outputs of the index, he/she can click on the “Export To Excel” button that it is located in the right corner of the screen (Fig. 12 No. 3). By clicking this button, a browse window will open to select a name for the excel output file in a wanted path (Fig. 13). 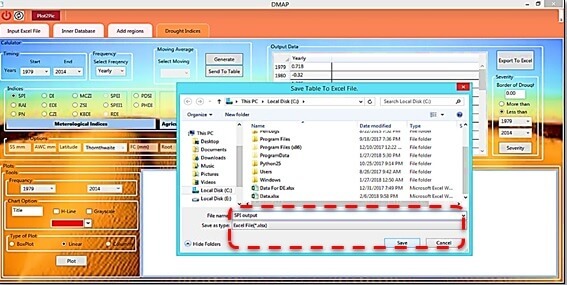 When the file successfully saved, the user can see a small dialog box that will show a message with this content “The file was saved successfully” (Fig. 14). If you want to plot the values of calculated index, you can set some characteristics of the plot settings. You can do this settings in the “Plots” panel as shown in Fig. 15 No.1. In the “Tool” option, first the user can select desirable domain for start and end year. In “Chart Options”, you can type a proper title (Fig. 15 No.2, in this sample we have typed “SPI Mashhad”) for your graph and also if you want your graph has horizontal line in the background you can click the “H-Line” option (Fig. 15 No.3). 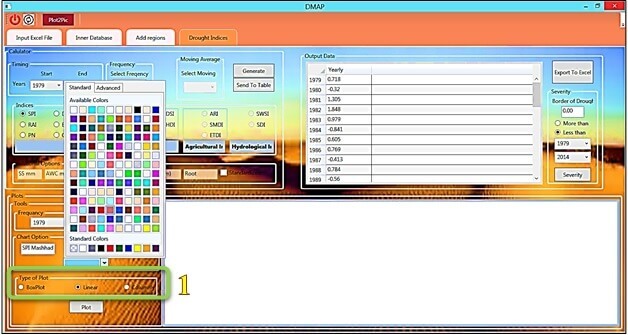 You have two options for selecting the color of the graph, namely “Grayscale” and “Color plot”. If you don’t select other colors you can just click “Grayscale” option, otherwise click on the combo box, then you can see lots of different colors and as well you can select one of them for the graph (Fig. 16). At last, you can choose your “type of plot” (Fig. 16 No. 1). There are three options, namely “BoxPlot”, “Linear”, and “Columnar” (Fig. 16 No. 1). Finally, after selecting the type of graph you can click on the “Plot” button, and observe the selected graph. The selected graph in this example is “Linear”, so in Fig.17 you can see it, according to this graph since the typed titled was “SPI Mashhad”, so in the presented graph you can see this title. If you want to change it you can easily do it by typing another one in the “Chart Option” panel. In Fig. 18 and Fig. 19, we plotted the yearly boxplot of SPI values, and the yearly columnar plot of SPI, respectively by clicking the “Boxplot” and “Columnar” options. One of the most important characteristic that Agrimetsoft was considered in the DMAP (Drought Monitor and Prediction) software, is calculating severity and duration of drought event. In Fig. 20 and in the right side of screen, you can see a panel with the name of “Severity”. In this panel for calculating the severity and duration of drought in a specific region, first of all you should determine the range of the desirable drought, for example in SPI the specific border of drought classification is less than -0.99. This border can easily find for every index according to the origin paper that was published for each index. You can select one of the two options, namely “More than” or “Less than”. Fig. 21 presented the severity and durations of drought index. In this sample, we have calculated SPI, so the label of “Y” axe is “SPI”. Also, as you can see in Fig. 21at the top the graph, there is a table that. 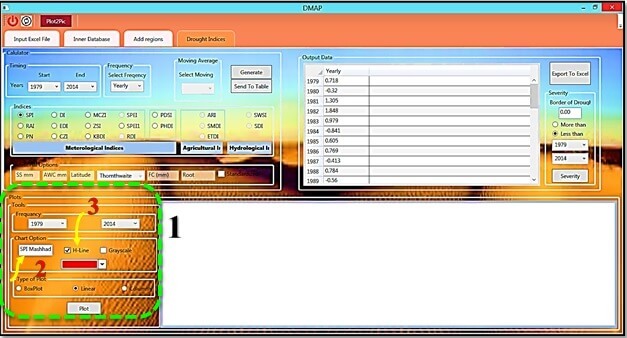 In the Drought Monitor And Prediction (DMAP) software tool V1.0, the input files can have different format of data, including xls, xlsx, txt, and csv, an in the Drought Monitor And Prediction software tool V1.1 beside the mentioned formats, the NetCDF (nc and nc4) as well supported. Also, there is a tool in the V1.1 which can extract data for a point and an area from a NetCDF file; if you select a region, you should calculate the mean value of the region. 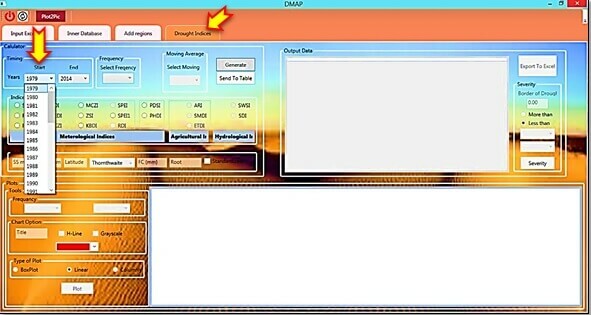 In the DMAP (Drought Monitor And Prediction) V.1.1, there is an option which can convert the unit of data of NetCDF files, for example, consider the models of CMIP5, the precipitation values are in flux so that this tool can convert flux value to mm value. The timescale of input data can be in daily, monthly and yearly. Be careful; if you enter yearly data to the software, then you can't compute the value of drought index on a monthly scale. 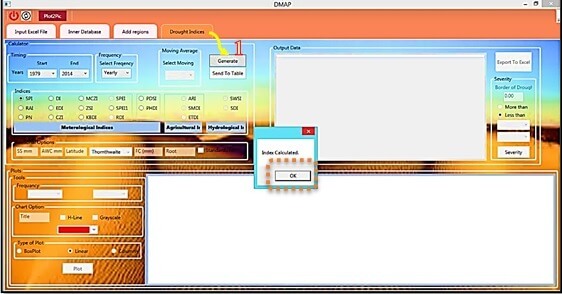 Some of the indices such as KBDI and EDI need to daily data, if you use monthly and yearly data as input to the Drought Monitor And Prediction tool V1.1, so you can't obtain the value of these indices, and the Drought Monitor And Prediction software (DMAP) tool V1.1 can't calculate the amount of them, and the calculation icon would be deactivated. 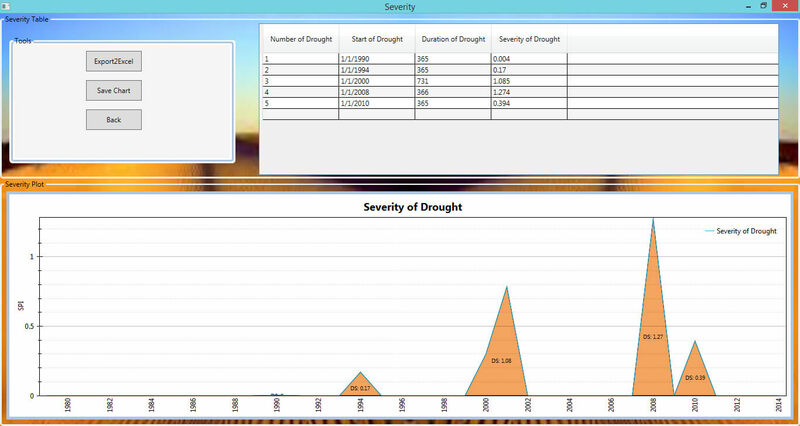 The Drought monitor software tool V1.1 can compute 19 drought indices in different types of drought, including meteorological drought, agricultural drought, and hydrological drought. The indices have different types. 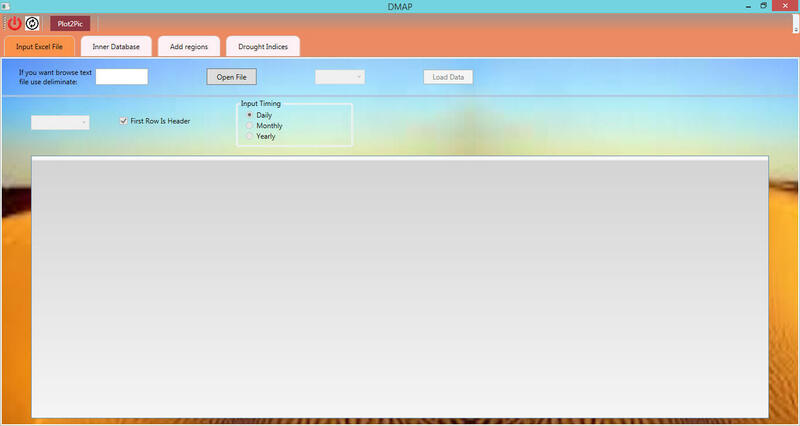 You can enter five values as input data into the Drought monitor software tool V1.1. For calculating of each index, we should consider the original relation and equation of the index which has one or more input data of the five variables. 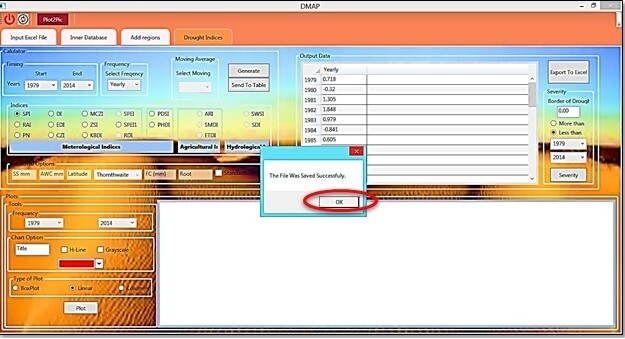 The Drought monitor software tool V1.1 is an intelligence tool, since when a user wants to evaluate a drought index, then the index which relevant to the input data variables would be active. In the first tab, the variables are entered to the Drought monitor software tool V1.1 are as a time series (daily, monthly, and yearly). 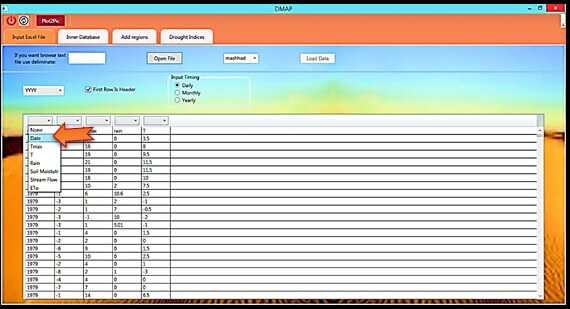 But by considering the kind of drought index, some of the other inputs maybe need to enter in the second tab (additional section), for example in the PDSI drought index; we need to enter geographical latitude, which during the calculation drought index, the user should enter them as a requested input variable. Depend on the type of drought index; you can calculate drought index at various time scale, including daily, monthly, yearly, and moving average. The remarkable point is that if you choose a monthly scale, the "Moving Average" Combo box would be activated, and the moving average of one month is equal to the monthly scale of the selected index. The value of evapotranspiration can be calculated through three methods, including ThornThwaite, Hamon, and enter the amount of evapotranspiration from input data, which selection of these three methods will be made through the active combo box (that it is selected after the selection of index). For computing the SPEI, there are two icons, one of them is related to the "SPEI" which represents that the amount of SPEI is calculated by computing evapotranspiration via ThornThwaite and Hamon methods, also the other is "SPEI1 that related to the calculation of SPEI by the amount of the evapotranspiration which enters by the user. For calculation of PDSI and if you apply the amount of computed evapotranspiration, then you need to fill three items, including Surface Soil water in mm, Available Water Capacity (AWC) in mm, and Latitude in decimal number. 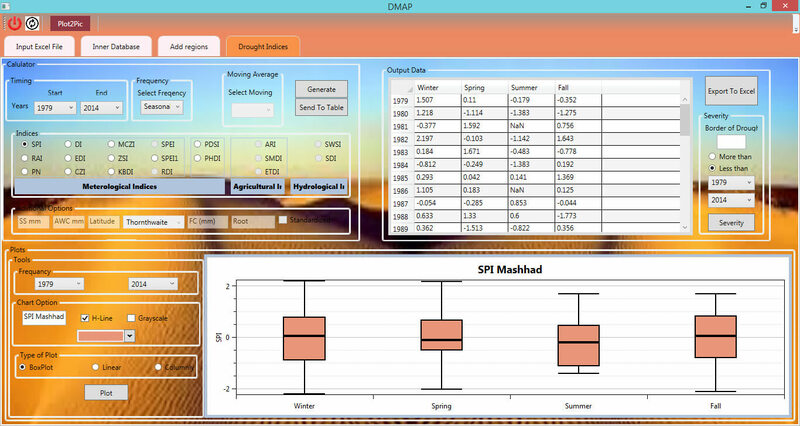 For calculation SPEI and with using the amount of computed evapotranspiration, the user should write the value of Latitude in decimal number. For calculating the KBDI, we need to write the value of Field Capacity (FC) in mm. For calculating the RDI, the user can select the check-box of "Standardized," which this icon will present the Standardized RDI. 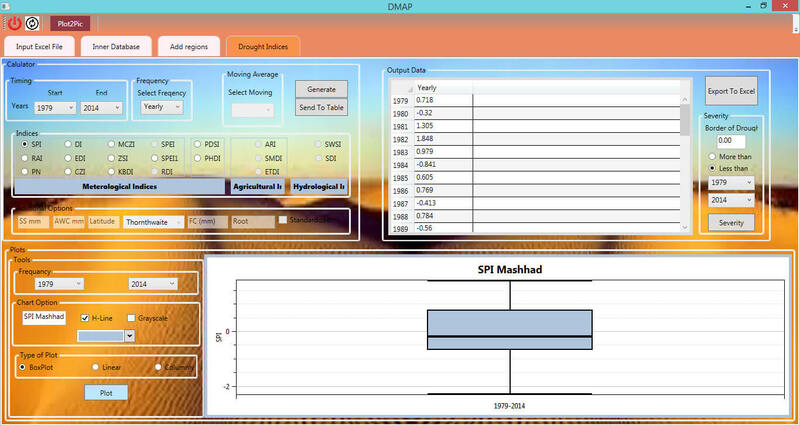 In the Drought Monitor And Prediction software (DMAP) tool, there is a panel for plotting graphs. There are three various kinds of graphs, namely BoxPlot, Linear, and columnar. Also, you can select every color that you want for your graph. There are two other options with names of H-Line and Grayscale that H-Line adds the horizontal line on the graph and Grayscale creates gray color for your graph.